At least that's what they were doing when I got home last night. 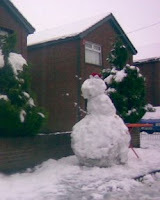 It's quite an impressive snowman, isn't it? Putting the head on must have been quite a job. Now I think I'll go somewhere warm.